He is the photographic memory of the Reeperbahn, the photographer Günter Zint, who always has a camera at hand. Almost all the stars of rock history, such as the Beatles, the Doors and Jimi Hendrix, he had before his lens. At the dpa in Frankfurt, Zint completed his training as a photojournalist and had his first reporter jobs at “Quick” and “Twen”. In 1964, he moved to the Hanseatic city and in addition to his commitment to the Spiegel, he was a regular guest and kept his everyday life in the Star Club with his camera. There he photographed the Beatles, the Rattles u.a. Sizes of this era. In the sixties he founded together with the photographer Hinrich Schultze, Marily Stroux, Gaby Schmidt, Jutta Stadach and Inge Kramer the Panfoto agency for the distribution of alternative press photos GmbH. 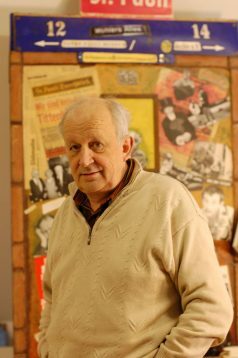 In the late 1960s, he founded the St. Pauli Nachrichten – a satirical leaflet that became a successful, million-listed, left-wing, tabloid newspaper. The editorial team included Stefan Aust and Henryk M. Broder. Zints pictures of the harbor road and the demonstrations around the AK movement made him the number one Germany political photographer. Zint became the home photographer in the legendary Salambo, whose eccentric operator René Durand supported him until his death. Together with Günter Wallraff, he took care of the pictures in his book “At the Bottom”, which ruthlessly pointed out the German working world for Turks. In the 1980s, Zint attempted to house his extensive collection of exhibits, documents and photos in a museum in the St. Pauli district, but his vision of a St. Pauli Museum initially proved difficult to finance. Since 2005, the collection is carried by a private association in the St. Pauli Museum. Here a part of the material is presented to the public. The black-and-white photographs by Günter Zint have become icons of awakening for a whole generation. Even today they have not lost any of their fascination. Especially well-known are the pictures of the prostitute Domenica Niehoff, with whom Zint connects a long friendship until her death in 2009.